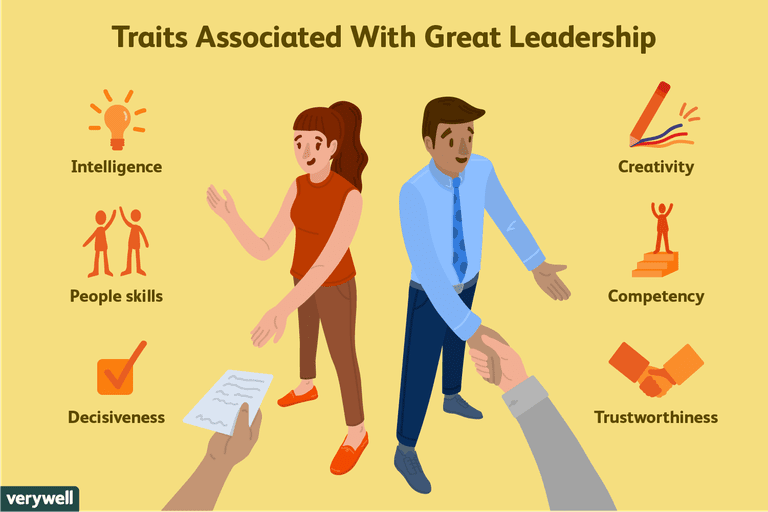 Can certain traits predict your leadership success? The trait theory of leadership focuses on identifying different personality traits and characteristics that are linked to successful leadership across a variety of situations. This line of research emerged as one of the earliest types of investigations into the nature of effective leadership and is tied to the "great man" theory of leadership first proposed by Thomas Carlyle in the mid-1800s. According to Carlyle, history is shaped by extraordinary leaders. This ability to lead is something that people are simply born with, Carlyle believed, and not something that could be developed. Carlyle's ideas inspired early research on leadership, which almost entirely focused on inheritable traits. Certain traits produce certain patterns of behavior. Patterns are consistent across different situations. People are "born" with leadership traits. Even today, books, and articles tout the various characteristics necessary to become a great leader, suggesting that leadership is somehow predestined in some (or is at least more likely) while unlikely, if not impossible, in others. Since the publication of Carlyle's thesis, others psychologists have examined argued the trait-based theory of leadership. From the 1940s to the 1970s, psychologist Ralph Melvin Stogdill suggested that leadership is the result of the interaction between the individual and the social situation and not merely the result of a predefined set of traits. Soon after in the 1980s, James M. Kouzes and Barry Z. Posner posited that credibility was a key indicator of leadership skills, characterized by such traits as being honest, forward-looking, inspiring, and competent. Intelligence and action-oriented judgment: Great leaders and smart and make choices that move the group forward. Eagerness to accept responsibility: Strong leaders take on responsibility and don't pass the blame on to others. They stand by their success and take ownership of their mistakes. Task competence: A great leader is skilled and capable. Members of the group are able to look to the leader for an example of how things should be done. Understanding their followers and their needs: Effective leaders pay attention to group members and genuinely care about helping them succeed. They want each person in the group to succeed and play a role in moving the entire group forward. People skills: Excellent interpersonal skills are essential for leading effectively. Great leaders know how to interact well with other leaders as well as with team members. A need for achievement: Strong leaders have a need to succeed and help the group achieve their goals. They genuinely care about the success of the group and are committed to helping the group reach these milestones. Capacity to motivate people: A great leader knows how to inspire others and motivate them to do their best. Courage and resolution: The best leaders are brave and committed to the goals of the group. They do not hide from challenges. Perseverance: Strong leaders stick with it, even when things get difficult or the group faces significant obstacles. Trustworthiness: Group members need to be able to depend upon and trust the person leading them. Decisiveness: A great leader is capable of making a decision and is confident in his or her choices. Self-Confidence: Many of the best leaders are extremely self-assured. Because they are confident in themselves, followers often begin to share this self-belief. Assertiveness: A great leader is able to be direct and assertive without coming off as overly pushy or aggressive. Adaptability and flexibility: Effective leaders don't get stuck in a rut. They are able to think outside of the box and adapt quickly to changing situations. Emotional stability: In addition to being dependable overall, strong leaders are able to control their emotions and avoid overreactions. Creativity: Perhaps most importantly, great leaders not only possess their own creativity, but they are also able to foster creativity among members of the group. Early studies on leadership focused on the differences between leaders and followers with the assumption that people in leadership positions would display more leadership traits than those in subordinate positions. What researchers found, however, was that there were relatively few traits that could be used to distinguish between leaders and followers. For example, leaders tended to be higher in traits such as extroversion, self-confidence, and height, but these differences tended to be small. There are obvious flaws in the trait-based theory. While proponents suggest that certain traits are characteristic of strong leaders, those who possess the traits don't always become leaders. Some have suggested that this may due to situational variables in which leadership skills only emerge when an opportunity for leadership arises (such as in war, during a political crisis, or in the absence of leadership). Meanwhile, others have taken a contingency approach to leadership in which certain traits can be more effective in some situations and less so in others. Opinions vary on what those traits are and to what degree they can predict success, if at all. More controversial yet is the contention that some people don't have the traits to become leaders. Such a belief inherently overlooks social and economic inequities that limit, if not entirely erase, a person's potential to lead. It also overlooks the changing economy and how leadership is defined when connections are today made both online and offline. As outlets for leadership continue to change (such as with social media and e-commerce), the traits needed to succeed are different simply because there are fewer intermediaries. Within this realm, the ability to influence is arguably more important than the ability to lead. While these traits are often linked to effective leadership, it is important to note that few leaders possess all of these traits. Generally, a strong leader will have many of these qualities. But aspects of the situation also play an important role in determining if people are able to lead well. In many cases, it is the interaction between these traits and the situation that determines leadership quality. How Effective Is Democratic Leadership? Have you ever wondered what your personality type means? Or maybe you wanted to know whether you’re left-brained or right-brained? Sign up to get these answers, and more, delivered straight to your inbox. Nichols AL, Cottrell CA. What Do People Desire in Their Leaders? the Role of Leadership Level on Trait Desirability. The Leadership Quarterly. August 2014;25(4):711-729. DOI: 10.1016/j.leaqua.2014.04.001. Spector, B. Carlyle, Freud, and the Great Man Theory more fully considered. Leadership. 2016;12(2). DOI: 10.1177/1742715015571392. How Does the Type of Situation Influence Leadership? Why Do Some People Become Great Leaders? How Does the "Great Man" Theory of Leadership Hold Up? What Are Prominent Leadership Styles and Frameworks You Should Know? How Do Transformational Leaders Inspire and Motivate Followers? Is Democratic Leadership the Best Style of Leadership? What Are the Pros and Cons of Autocratic Leadership? How Does Laissez-Faire Leadership Work? How Does Transactional Leadership Style Work?